Are you stretching regularly as part of your fitness training? Stretching is just as important as exercising and shares many of the same benefits as fitness training. Stretching may increase your joint range of motion, which may improve your athletic performance and also decrease your risk of injury. Other benefits include better posture, fewer aches and pains and more self-confidence. Many of us spend the greater part of each day in the same position, which compromises blood flow to some muscle groups and leaves certain muscles short and tight as a result which can affect the results of our fitness training. A good stretch improves blood flow to the muscles, helping to counter some of these problems. This increase blood flow also sends more oxygen to your brain, helping you to feel more alert and happy. Don’t stretch a cold muscle. Performing stretches after your fitness training is ideal. 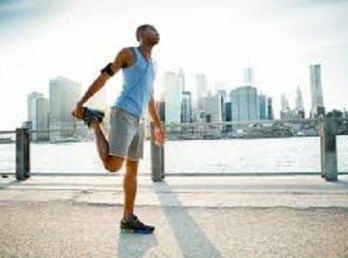 If you are not planning a workout, before you begin a stretching routine, warm up your muscles with 5-10 minutes of walking or other comparable movement. Your goal should be equal flexibility on both sides of your body. It is not uncommon to be tighter in one hamstring than the other, or to be able to reach lower down your back with one arm than the other. This can change, however, with regular stretching. Hold your stretch and don’t bounce. Bouncing can result in small tear to the muscle. Instead, hold your stretch to the point of discomfort, but not pain, and slowly try to increase the reach over time (aim for 30 seconds per stretch). Make your stretching routine a regular part of your fitness training routine, with a goal of 2-3 times a week. If you have an injury (or previous injury), be cautious with your stretching. Stretching an injured muscle may cause more harm. Although stretching should help you feel better and ease your movements, it will not prevent you from injury. Proper care and good form are also very important. Including regular stretching into your fitness training benefits your health and well-being.